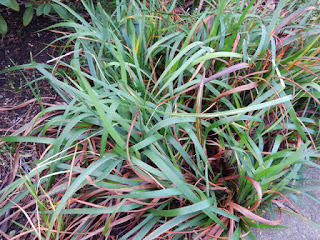 Winter in the Garden: To trim leaves on PCIs or not? A couple of years ago, I posted a comment about having used a dry sunny break in the weather to clip back iris leaves and clean up the garden. Several people reprimanded me for doing so, saying I was taking away these plants' capacity to photosynthesize in coming weeks until the new shoots came into full growth. With PCIs, sometimes that is true, and sometimes it is not. 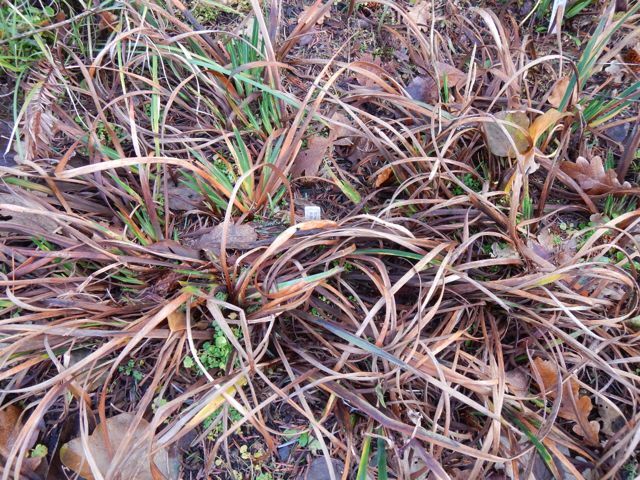 PCI "Clarice Richards' stays green all winter; brown leaves are tugged/clipped off in late winter or early spring. A storm called an Atmospheric River blew through this week; regionally these are called Pineapple Express storms, which bring warm air, high winds and heavy rain. About 11 inches fell in 3 days, ending with more than 5 inches of rain yesterday, a day so wet that salmon could just about swim in the air instead of the streams. Today the sun came out for the first time in nearly a week. I took photos in the garden of the "photosynthesis-deprived plants" that I trimmed back that fall. My focus in past years for clipping was plants that had brown leaves. 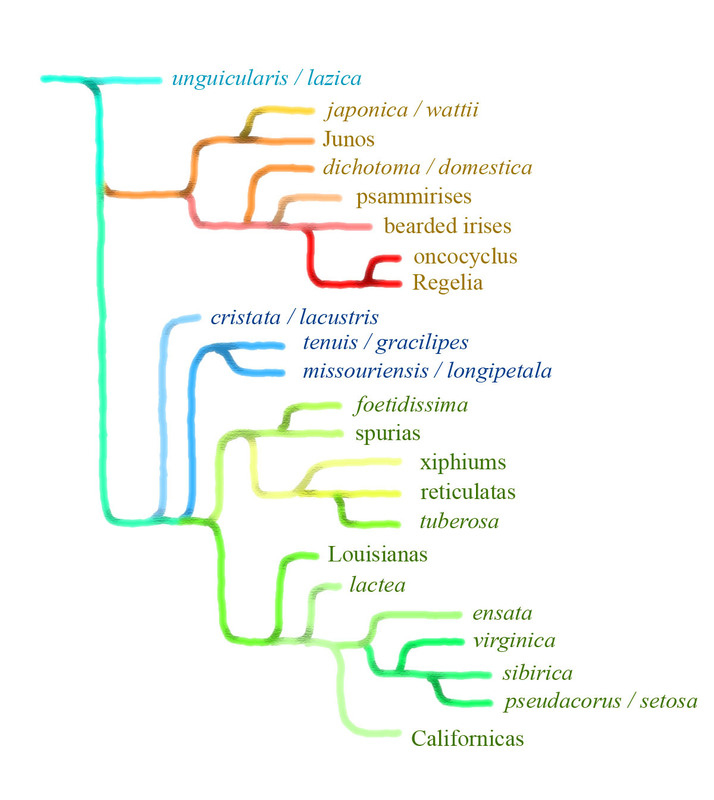 Many PCIs have mixed genetic heritages from most of the species in this group, and the degree of browning, if any, varies with those genes. 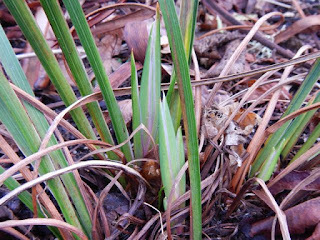 Iris innominata has almost completely browned off by mid January. 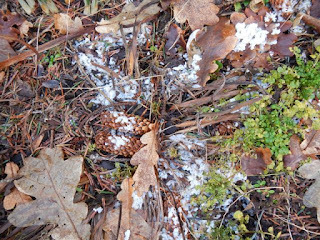 With snow, it will go completely dormant. 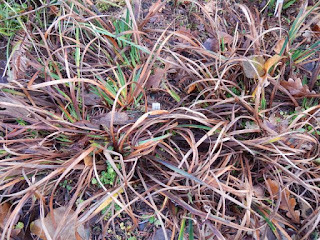 A typical PCI clump in the winter garden, PCI 'Finger Pointing', has a few green shoots and weeds, and a lot of brown. Which groups stay the greenest, and can be left alone throughout the winter? 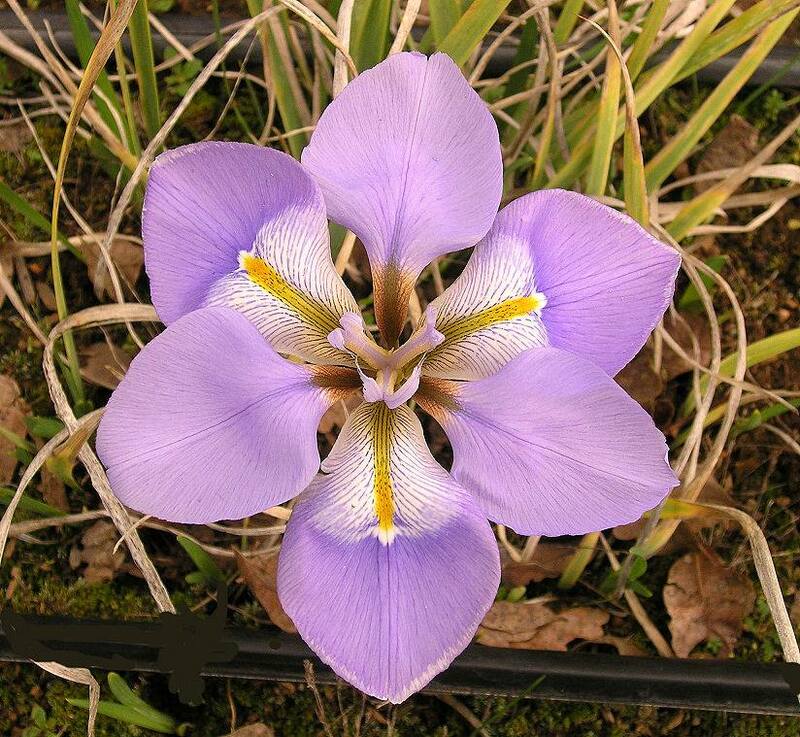 Iris douglasiana-derived hybrids. 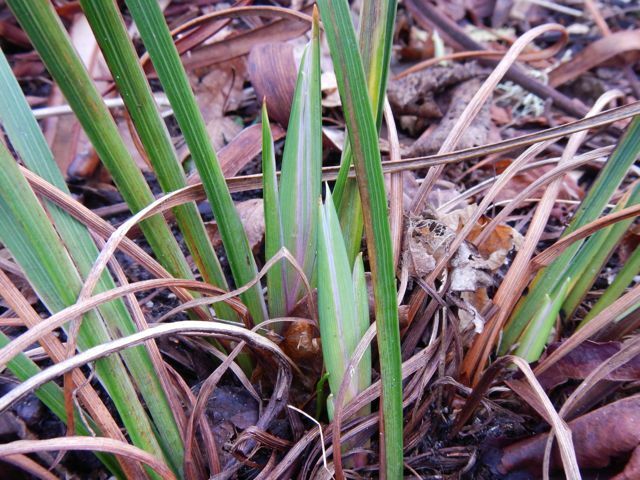 Iris douglasiana selections and hybrids with considerable "Doug-blood" stay green all winter long. A few brown leaves are tugged off in late winter or early spring. 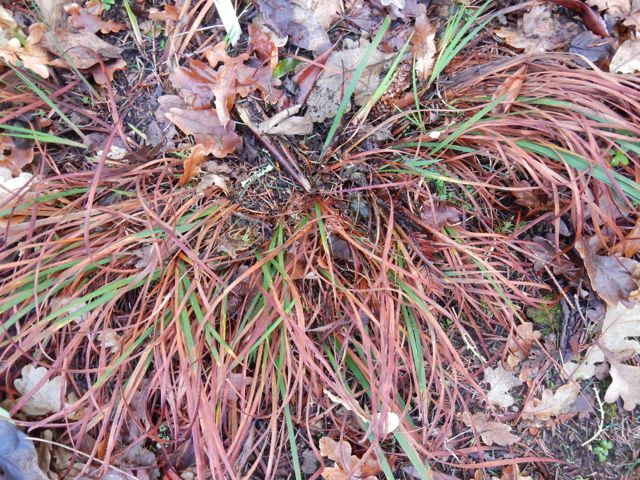 Which groups go the brownest, so that by early winter, the only green leaves are the new shoots? 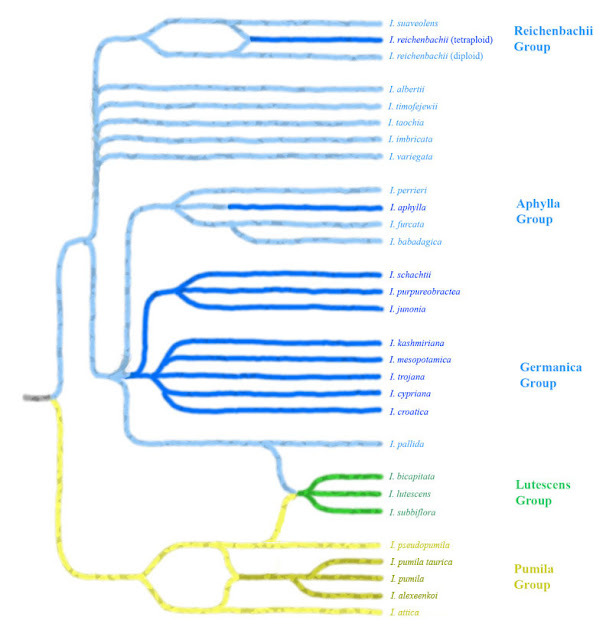 Joe Ghio's hybrids, and others from his mixed species pool of gene stock. Also, Iris innominata/I. 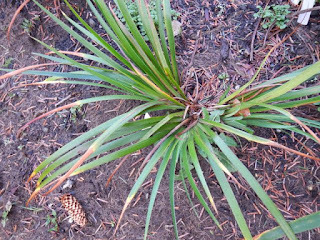 thompsonii plants go brown by midwinter. Ghio hybrids typically brown off by early winter. The only green to be seen is weeds, and a few tiny new shoots. Which groups go completely dormant and lose leaves? Iris tenax and I. hartwegii. 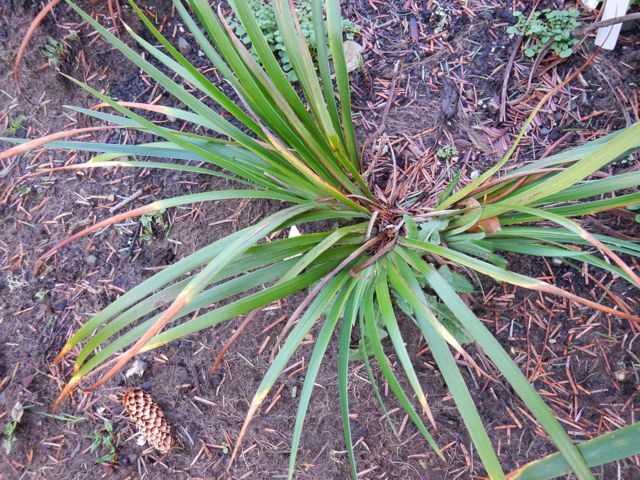 These species' leaves vanish by midwinter. 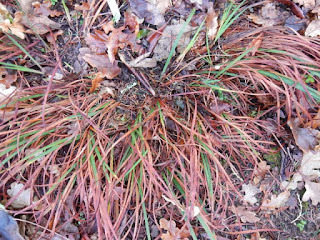 Iris tenax vanishes underground by midwinter. Old leaves and winter cress plants will come out when I clean up the oak leaves and spruce cones in a few weeks. Spring is coming! 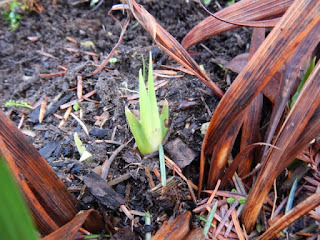 Among all the brown leaves and debris, I saw several new shoots on most of my plants. 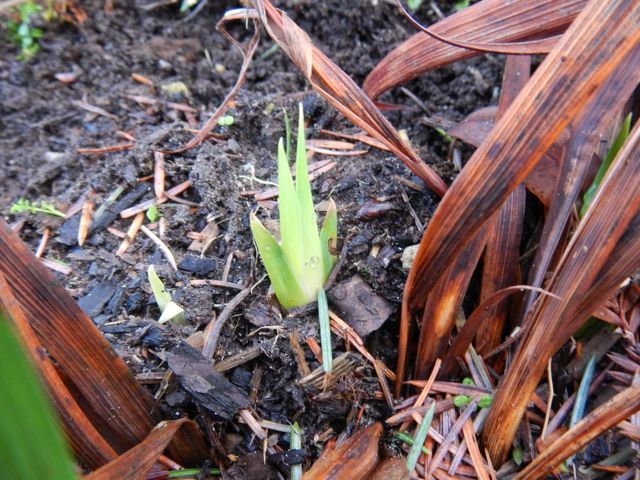 A few have died; one that I though died last fall came back with several new shoots, and the rest have those small green fans we love to see in early spring. Now, if the weather stays dry for a few days, I can take my annual soil sample, and start pruning and tidying the garden beds. 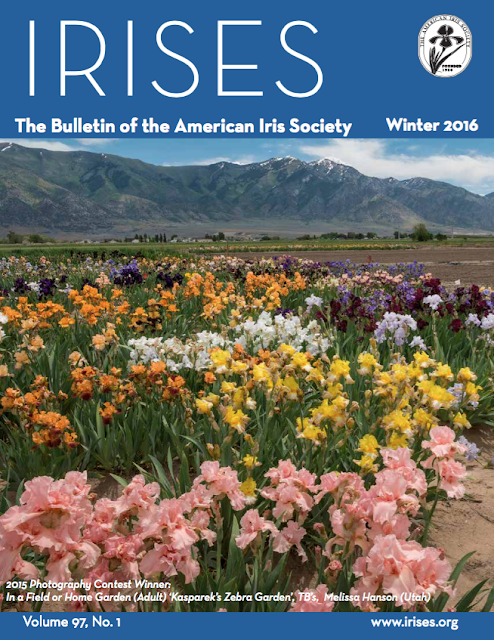 A warm welcome to those who are seeing the cover of yet another wonderful issue of IRISES, the Bulletin of The American Iris Society. The image below is a majestic view of the Kasperek's Zebra Gardens and iris fields in Utah, photographed by Melissa Hanson, Winner of the 2015 AIS Photography Contest, category "In a Field or Home Garden." The Winter 2016 issue of the AIS Bulletin is now available for online viewing within the Emembers section of the AIS website. Note: to access this area of the website you must have a current AIS Emembership. AIS Emembership is separate from the normal AIS membership. Please see the Electronic Membership Information area of the AIS website for more details. In this edition of IRISES, meet the new AIS President, Gary White on a beautifully detailed introductory article on pages 6 — 8. Learn why Fred Kerr, the creator of beautiful 'Queen's Circle,' won the 2015 AIS Hybridizer Medal, as announced on page 9. Read about news from different iris organizations on Section Happenings by Jody Nolin, on page 12. 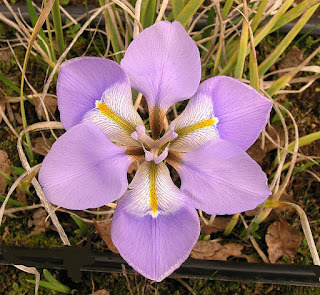 Don't miss news from the Japanese Iris Society, the Spuria Iris Society and the newest group to join the ranks, the Novelty Iris Society. Riley Probst reports on pages 15 and 16 about the 2015 AIS Tall Bearded Symposium, some wonderful statistics and lastly all the results, which are always interesting. The 2015 AIS Photo Contest Winners are recapped with gorgeous photographs, individual iris shots, irises in garden settings and irises and people. Don't miss them, they are on pages 29 — 33. Always inspiring, Remember Friends is a section that provides us with a glimpse on the life of those irisarians now gone, on pages 34 – 36. We hope you are attending the 2016 National Convention in Newark, NJ on May 23 —28. In case you have not seen the registration form online we're happy to share it on page 37. Some information on the convention, such as hotel and gardens are on page 38. 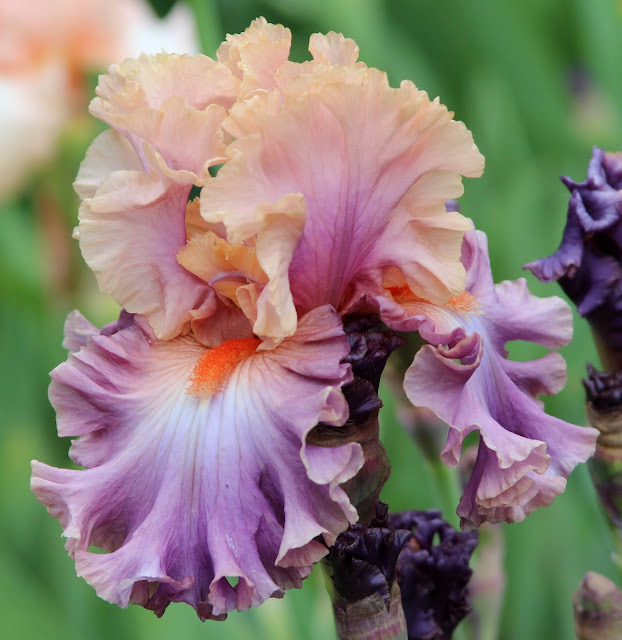 And, a fantastic article in beautifully crafted words and photos by Mike Lockatell on what you will see at The Presby Memorial Iris Gardens, called "Presby Defies TIme," on pages 39 — 41. Also, Paul Gossett describes for us on page 42 beautiful Glenara Gardens in Upstate Central New York. 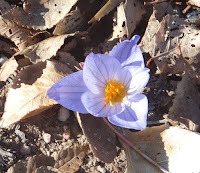 If the word and photographs inspire you please join us in the Spring. Future convention dates, plus important AIS Board meeting times and locations are on page 55. Lastly, a great picture from the AIS 2015 Photo Contest that deserves your attention. Our little Comedy of Iris garden is located in central California, in a primarily agricultural area, which means we have a nice amount of space to start with (about an acre of open, slightly sloped land), but also some significant challenges when it comes to the dreadful native soil. As I mentioned previously, our soil has two basic textures—pudding when it rains, and concrete the rest of the time. Luckily, the nutrient level is very low! (Hooray?) So trucking in good soil and amendments was a necessity. I had six yards of a really lovely loam delivered, and much to my astonishment, I have used it all. But, only the best for my newly purchased rhizomes, because, let’s face it, I want to see massive glorious blooms in the Spring! Additionally, our hard ground is home to several kinds of critters that love it when we water—it makes the soil soft for them to dig through, and gives them something tasty and nutritious to eat. I, personally, do not like killing critters when they are in their territory, but no amount of reasonable conversation makes ground squirrels understand that they should go around the foundations of your barn when tunneling across your property. And gophers don’t care that the plant they just destroyed was a gift from your recently deceased mother... it was moist and tasty! Basically, any time you add water to our land, you attract the very vermin you want nowhere near your precious plants. Ugh. Furthermore, it gets very hot here, and it’s quite dry. Because this is basically an irrigated desert, it’s over 100 degrees for weeks at time—so, really hot. And managing the watering (which requires more care during a drought) is also critical. Iris don’t like to be too wet (or they rot), and managing their moisture and nutrients is crucial for them to propagate and increase. But creating moisture means attracting critters that will eat their roots, if not the entire rhizome... wheeee? So, even after we had good soil brought in, we faced challenges in keeping critters out of the beds, and not losing our stock to heat or rot. Time for some creative solutions. When I was gardening back in my suburban setting, the soil was decent, critters were few, and the water was a spigot away... it was easy. All I had to do was not over-water, and feed once or twice a year, and I had gorgeous, happy iris all the time. 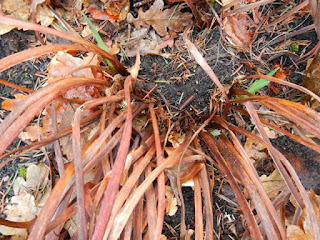 After moving here, with the more challenging conditions, I have tried a variety of solutions, after losing most of a bed of named iris to a ground squirrel. I took up the few remaining iris, and dug out the entire bed to a depth of about one foot. I molded tight-weave chicken wire into an open-shoe box shape, and laid it into the hole where the bed had been. I then re-filled the bed, and planted a new batch of rhizomes, confident I had outsmarted the little blighter. Joke was on me, though. Several weeks later, as I was watering, I noticed a bump of loose dirt near the outside edge of the bed, and that dirt was moving. “Ha!” I thought triumphantly to myself. “He’s just run into my chicken wire basket, and can’t tunnel his way through it!” I quietly laid down the hose, and watched to see what would happen. The little guy pushed the dirt out of the tunnel and popped his head above ground. I could see him looking around, so I held perfectly still. He ducked in again for a moment, then came up again, and to my outrage and astonishment, he got out of his tunnel, walked over the lip of the chicken wire barrier, and began to tunnel down into the bed, right in front of me! The hours spent digging out the bed, making the chicken wire barrier, placing it in so carefully, and replanting the whole bed was undone in one moment. I had been played by a ground squirrel! All bets were off after that. I dug up the remaining rhizomes from that bed and moved them into pots, but I never liked that solution, nor did my plants. Then I struck on using pallets as beds, which did a good job once I got the soil combination right. I placed the pallets on rocky ground, where the squirrels don’t really dig, and then filled all the slats with a combination of native soil, amendments, and planting mix. This had the added advantage of making it simple to keep iris from one bed or section from creeping into another section. I kept only one kind of iris in each pallet, and there was never any confusion. If we ever have an emergency, I can pick up the entire pallet and move it, bed and all. We knew from the beginning of this project that just digging up a little bed in the ground and plunking down the rhizomes was not going to be the method for success. For this initial growing year, we are trying a combination of kiddie pools mounted to pallets, raised beds (with a base of weed blocking cloth and wire mesh), and tires (with the same wire and cloth base). We cleared the surface of the soil of the dried and dead native growth (code for “weeds”), and began to layout the different kinds of beds we had to see how they might best work with the kinds of iris we ordered. This was our preliminary layout, after we cleared the weeds, but before we put down the weed blocking cloth and wire. Ok, and before we painted the tires. We opted to use only one level of these raised beds for this first year to see how they would do. 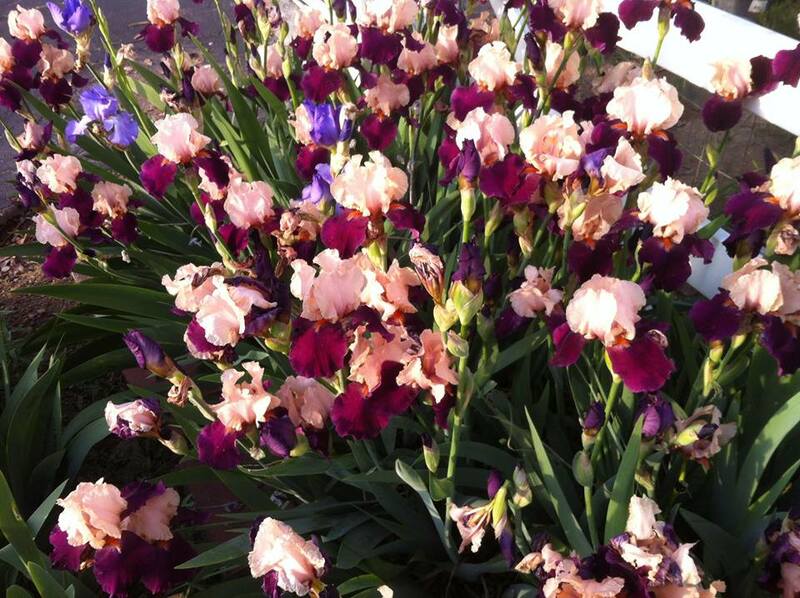 To give the iris the best chances for success, separating them from the ground was the smart move. Besides, I don’t want to encourage any further comparisons between myself and Carl from Caddy Shack. The project has expanded considerably since this first phase, so you’ll have to keep your eyes peeled for updates and new photos. And you can bet there will be another load of the gorgeous loam heading our way sometime in the near future. Please, just don’t tell the gophers or ground squirrels. 'Leave The Light On' ( Riley Probst, R. 2013) Seedling #U4WHXHM. IB, 22 (56 cm), Early, midseason and late bloom. Standards blue-purple with 1/16th gold edge; style arms bright yellow, vertical purple veining on style crests; falls blue-purple luminata pattern, bright yellow area with 1/4" white spear extending downward from beard; beards orange; pronounced sweet fragrance. 'Wild Hair' X 'High Master'. Fleur de Lis Garden 2013. Honorable Mention 2015. 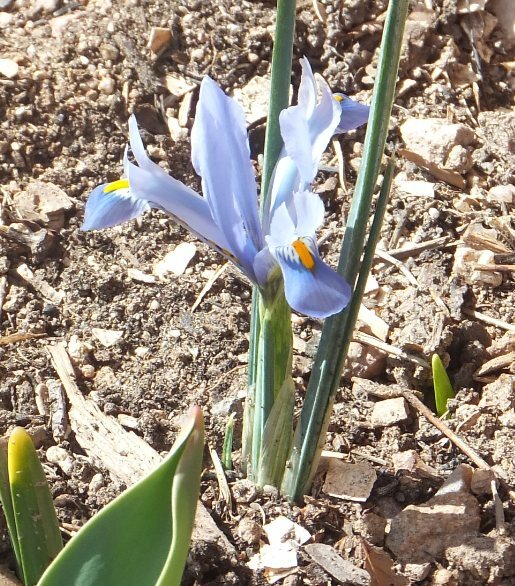 Back in September, Chris and I decided to start a growing project that I lovingly call ‘a comedy of iris.’ We had the general idea of having a larger-than-personal growing and touring garden on a piece of property near our homes (originally bought for my mother). In order to address the issues we have in our area of poor soil, temperature and moisture extremes, and a hearty population of burrowing critters, we also decided to experiment with different kinds of beds and watering systems. We did not have a hard-and-fast idea of what this project would look like, which is to say, we had a lot of enthusiasm, but not a concrete plan… The comedy will probably just write itself. September is late in the season for ordering and planting iris, but not too late, particularly in our climate. The temperatures in September were still hot, even as the days became shorter. So, online we went, iris shopping with a purpose! And, as the shipping season for iris ended in mere days, choosing the iris for our first year of growing was the top priority. An urgent, must-do task of immediate importance. I figured that should be Step One. When you have as much enthusiasm for iris as we do, it’s remarkably easy to find yourself spending, say, two or three hours shopping for iris online. It’s also easy to click “add to cart” a shocking number of times in that duration. And having a reason to buy more than you already have, well, that is a bit of a dream come true. But choosing carefully, and for purposes beyond “Ooooooh, pretty!” meant slowing down, methodically selecting for attributes and qualities outside of personal preferences. I also needed to ensure I didn’t purchase iris Chris already had and vice-versa, which put the brakes on the runaway shopping spree aspect of populating our first beds. So it slowed down our Step One a touch, which was probably beneficial. The “before” shot. This is the area where our glamorous garden now exists. But the beds weren’t ready for an imminent shipment of rhizomes, so certainly preparation of soil needed to become a top priority, and get done ASAP. This meant we needed to find someone to bring in high-quality soil, as our native soil is, um, well “poor” is the nice way to say it (more on our native soil later). So finding someone to truck in really good planting soil had to be put first on the list of accomplishments. Of course, before the beds went in, we had to decide on the layout and which kind of watering system we’d be using so those would be ready before the soil arrived, making that the thing we had to start with pronto, maybe even sooner. Definitely, we needed that done as the initial step. Right after purchasing all the parts for the drip and soakers, which we couldn’t really do until we’d finalized the layout, which would depend on how many iris we bought, and also be somewhat determined by which iris we bought since some of the layout of the beds would undoubtedly be dictated by the types and colors of iris in our purchase... So, we really had to get that done first. Wonderful loam, delivered right to the edge of the garden. To my surprise, we have used it all! More soon on adventures in layout design, what kinds of beds to employ, and what kinds of obstacles greeted us as we moved forward. Let me just say this: kiddie pools. Blue shade of pink, lined deeper on F.; tangerine beard tipped lighter. 69-2 (New Frontier x Signature) X Dove Wings. When I started actively gardening about 20 years ago, I just wanted to grow some beautiful flowers. I had no idea the impact gardening would have on me and my life. I found that working in the soil and seeing the miracle of rebirth that takes place when the plants woke in the spring was indescribable. most, however, by trial and error in my own flower beds. journaling is the perfect place to start? Keep a garden journal. A journal can be as simple as a spiral notebook. I start a new journal every year, and have a separate one just for irises. It contains planting dates, bloom times, plant performance, any insect or growing problems, the action taken to solve problems, and the outcome. Weather-related problems, with freeze or early warm up dates, and the moisture levels for that year are included. Plant information such as the hybridizer, introduction year, plant height, sun, water, and fertilization requirements etc., are kept in an iris journal in a folder on my computer, tagged with its picture. It's been interesting and helpful to compare the data from year to year. As I look back on my journals over the years, one of the most pleasurable things is to read my thoughts at that time: The anticipation of the year's first bloom in the spring, the excitement at the bloom of a new cultivar, the quiet beauty of an early morning walk through the beds after a spring rain, the amazing colors at peak iris bloom time in the gardens, the childlike wonder seeing a bud unfold, or even the debate I have with myself trying to make room for "just one more" iris! Yes, journaling has been an important and special part of my gardening. Make a garden map. There is no substitution for a good garden map to keep track of your plants. They've been invaluable for success in my gardens. An easy way to make a map is to simply walk around your garden with a sheet of small grid graph paper. Write down the names of plants as you see them in the bed. Then you can take that information and transfer it to the computer. Making changes when plants are added, removed, or transplanted is very easy to do with this system. Hard copies can be printed off and taken out to the garden for quick reference. I like being able to see the garden on paper at-a-glance. I use this method of journaling to design a bed or figure out color schemes and placement of plants as well. I'd be lost without my garden maps. Use a plant marker system. Since irises look much the same when not in bloom, plant markers are an excellent way to keep track of them. I've had good results by writing names on durable plastic plant markers with a black grease pencil or a black oil-based paint pen. Other markers, even though they claim to be permanent, still fade. I've seen all kinds of markers--blind slats, tongue depressors (although these don't hold up well), plastic cutlery, metal engraved ones--it doesn't matter what you use as long as it is durable and reliable. Take lots of pictures! There are many reasons why photos are valuable in your journal-keeping: Pictures give the date and time the picture was taken. Tagging photos with pertinent information, such as cultivar name, hybridizer, height, bloom time, etc., makes it quick and easy to find any bloom you've photographed. Irises in an individual folder on my computer, listed by name in alphabetical order has been a system that has worked best for me over the years. Australian researcher Mike Steven said that domestic gardening has the potential to satisfy 9 basic fundamental human needs in our everyday lives: "subsistence, protection, affection, understanding, participation, leisure, creation, identity, and freedom." I think Andi Rivarola sums it up: "Merging ourselves in the garden makes for a meaningful interior life." I know this has certainly been true for me. If you haven't kept a garden journal, or implemented the tools mentioned, I encourage you to start now--2016 is the perfect time to begin! Do you keep a garden journal? If so, has it made your gardening experience more meaningful? I'd love to hear from you. It all started for me quite some time ago, at least several decades, but the exact moment is lost. 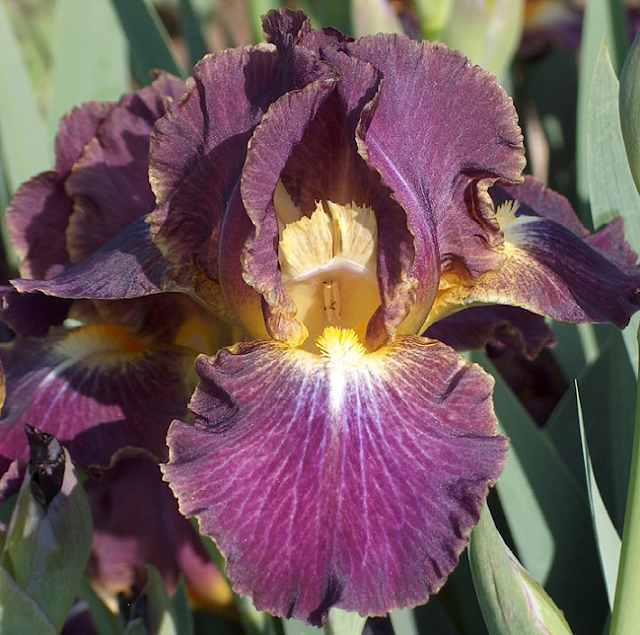 It probably wasn’t really a moment, though, it was more like a gradual awareness, and then an appreciation, and before I knew it, like so many others, I was officially an iris enthusiast. If you aren’t aware of the dramatic and exciting world of iris, then, yes, I am referring to the flowers. When did I fall in love with iris? I can’t really say. But fall in love I did, and that love has inspired a project, the breadth and scope of which only love could inspire! Yes, this is a love story, to be sure! 'Twice Told' (William Maryott, R. 1994). Sdlg. L172D. TB, 34-36" (86-91 cm). Midseason bloom and rebloom. Standards flesh to light beige, slight maroon at midrib; Falls velvety medium red maroon; beards tangerine. H92B: (F154D: (('Latin Lover' x 'Victorian Days') x Keppel 74-32E: (('Roundup' x 'Artwork' sib) x 'Osage Buff')) x E31D: (('Dream Fantasy' x 'Pink Sleigh') x 'Heather Blush')) X 'Cameo Wine'. Maryott 1994. So, onto the players: Vanessa (that’s me) and Chris, two ladies who have pesky day jobs but still garden with a passion. 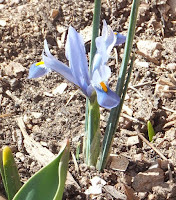 We are members of local chapters of The American Iris Society, and have had plenty of dirt under our nails. We met because of iris, and we have an absolute hoot gardening and talking shop and getting grimy in our gardens together. What fun it is to have an iris buddy! The plot is a simple one, or rather, it seemed simple when we first conceived it: grow iris. Well, ok, we are already doing that, so grow more iris. Have a touring garden. Work on a larger scale. Experiment with growing environments, layouts, watering systems. Meet the challenges of our climate and topography. Walk the line between full-on, blown-out love for iris growing, and the tweaky, quirky, danger zone of iris obsession. So, it seems this is a comedy. The setting: an almost rural neighborhood in central California. Chris has beds at her place, and I have some almost-feral beds at my home, but the primary focus of the growing project is at a separate property on my block. The weather here varies from very hot summer days (often over 110°F) to below freezing winter nights. The soil varies, too: concrete in the summer, pudding in the winter. And we have our share of hazardous critters, primarily ground squirrels and large gophers, but also sheep, dogs, gardeners, and the occasional raccoon. Thus you can tell this story is a farce. The inspiration: We have toured professional grower’s facilities, and have been educated and warned that growing for fun and growing for profit are very different activities. Since we’re both level-headed and practical, we are not proposing to put anyone growing professionally out of business, but we want to expand our gardens to a more-than-average scope. We will be growing iris out of love for the plants, not a grab for gold. So obviously, this story is a drama. 'Heartbreak Hotel' ( George Sutton, R. 1997). Sdlg. G-19-ARSA. TB, 37" (94 cm), Midseason late bloom. Standards and style arms salmon (RHS 27A); Falls imperial purple (78A); beards nasturtium red (32B), 1" salmon and violet purple horn; ruffled, laced; slight sweet fragrance. 'Sweet Musette' X 'Twice Thrilling'. Sutton 1998. To anyone who is already an iris enthusiast, or expert, or grower, or casual gardener, this may sound familiar. To anyone outside the world of iris, this story will probably be an eye opener, and a tour through a world you might hardly imagine really exists. 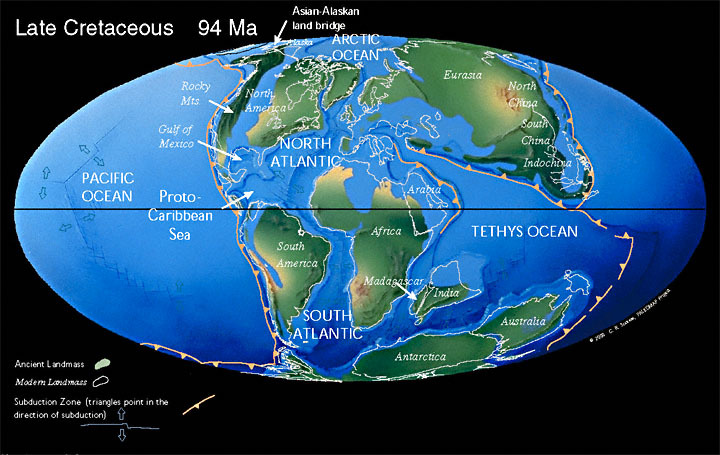 It has all the makings of an epic, spanning centuries and continents, involving science and luck, with characters from every place that has enough dirt and enough sun and enough water to grow a few weeds. I won’t cover that much ground in this first post, but no doubt I will eventually tell of the adventures of the humble and magnificent iris, and its swashbuckling journey from the old world to the new, from manor house to interstate rest-stop, and mostly, of how two nice ladies in the countryside are going to try their hands at growing iris for more than just the fun of it. Certainly, there will be laughter and tears, great successes, and frustrating setbacks. And once a year, there will be a glorious, magnificent, stunning bloom season. That’s our reward. While sharing our process will be fun and hopefully entertaining, sharing our blooms and our love of iris is really the main goal. Although we are well out of bloom season now, I promise to include photos in each post, to remind all of us why we go to so much trouble for one little plant.